Heart disease is the leading killer of both men and women in the U.S., which underscores the importance of cardiovascular research. Recently, a study published in the journal BMJ suggested that the mortality risk among heart attack survivors was lower for those who ate more fiber-rich cereal and grain sources after their heart attacks. The researchers assessed data gathered by two very large studies that spanned more than 20 years—the Nurses’ Health Study and the Health Professional Follow-up Study. From that data, they identified more than 2,200 women and more than 1,800 men who had survived a first heart attack. As part of the larger studies, participants regularly completed questionnaires about their diet and lifestyle habits, including intake of dietary fiber. After adjusting for factors such as age, medication and smoking, data analysis revealed that those who increased their dietary fiber intake the most after their heart attack reduced their risk of death from any cause by 31 percent, when compared to those who increased their fiber intake the least. When it came to cardiovascular death as the sole cause of mortality, the risk dropped by 35 percent for those who consumed the most fiber. However, this reduction in risk was only linked to cereal fiber, not fiber from fruits or vegetables. 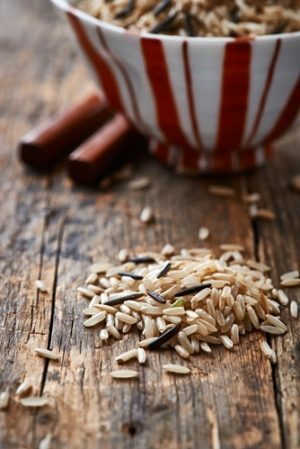 The study authors noted that previous studies have found, in general, the risk of coronary heart disease falls by 20 to 40 percent among those who regularly eat fiber-rich whole grains. The recommended daily intake is 25 grams for women and 38 grams for men. However, data shows that only 5 percent of people in the U.S. follow these guidelines. This is cause for concern, considering how beneficial fiber is for cardiovascular health. Specifically, dietary fiber helps decrease the risk of hypertension, obesity, diabetes, stroke, coronary heart disease, peripheral vascular disease and dyslipidemia. Additionally, foods that are rich in fiber tend to make people feel full when they eat, thereby reducing the risk of overeating. Considering how beneficial fiber is for cardiovascular health, it is prudent to strive to eat the recommended daily amount. But when it comes to heart attack survivors, the new study specifies that cereal and grain sources are the most beneficial, so what should you eat? Whole grains, which include the bran, germ and endosperm. Oatmeal and brown rice are examples of whole-grain foods. Refined grains, which are ground into flour, which removes the bran, germ and, along with them, the fiber, iron and B vitamins. The vitamins and iron can be added back in, but the fiber cannot. White rice and enriched bread are refined. If you are reading nutrition labels and want to pick high-fiber cereal foods, choose items with main ingredients that include whole grains such as: whole wheat, graham flour, oatmeal, whole oats, whole-grain corn, brown rice, wild rice, popcorn, whole rye, whole-grain barley or whole-wheat bulgur. Remember that a heart-healthy lifestyle is not just about what you eat. If you survived a heart attack and want to make sure you take good care of yourself, it is important to see your physician regularly and build a comprehensive plan to protect heart health. A private health advisor can work with you and your cardiologist to help you create a personalized plan that addresses exercise, diet, stress management and smoking cessation, and other key risk factors.